One of the diciest points in an airline merger is consolidating computer systems. That moment arrives Tuesday night for Alaska Airlines and its former West Coast rival Virgin America. Seattle-based Alaska Airlines bought San Francisco-based Virgin America a year and a half ago. 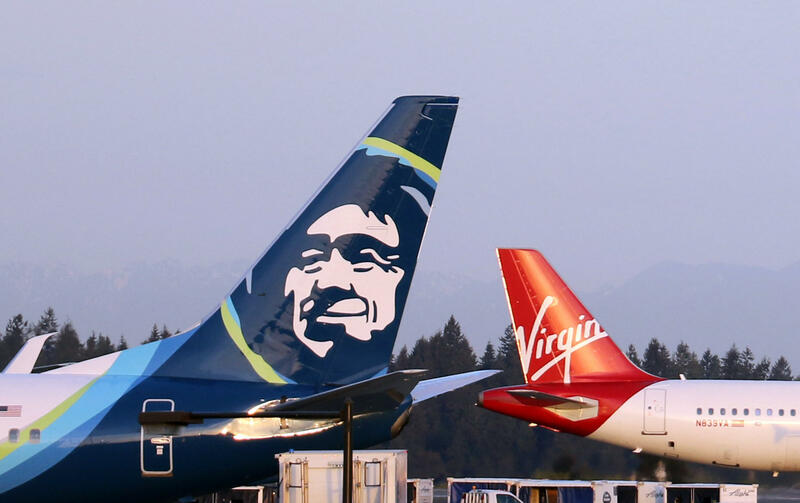 The process of merging the two carriers under the Alaska brand reaches "a crescendo" this week, in the words of Alaska Air Group CEO Brad Tilden. Beginning Wednesday, Virgin's ticket counters, kiosks and signage will disappear. Travelers will deal with one reservation system, one call center, one website and one smartphone app -- all Alaska's. Tilden told Wall Street analysts Monday that the company is now set to realize the benefits of its $2.6 billion acquisition. "As of this moment we think we are 65 or 70 percent of the way through the merger. By the end of this quarter, by June 30th, we think we'll be 85 percent of our way through the merger," he said. "I think we are in a really good position today." The rebranding won't be over right away. Repainting all of Virgin America's Airbus plans in Alaska colors and changing out the interiors will take until next year. That will eliminate the seat-back TV screens Virgin had. Alaska Airlines delivers in-flight entertainment by streaming content to passengers' own devices. As the Virgin America brand and its scrappy, hip culture flies into the sunset, the sting is somewhat salved for Virgin's pilots and flight attendants by the significant pay raises they receive on Alaska's more generous union contracts. Tilden said Monday that the successful negotiation of unified contracts was another reason he is optimistic about the merger of different work cultures. "We've got more work to do, but we do have 80 percent of our collectively-bargained payroll that has got new, market-based agreements," he said. "That is a great accomplishment. It sets us up to get integrated seniority lists, which sets us up to get the cultural stuff settled and moving forward." During Monday's quarterly earnings teleconference, Alaska's management also announced that the company would follow the nation's biggest three airlines in offering stripped-down, basic economy fares. Alaska said the new option, dubbed "Saver Fares," would debut in late fall. "This low-priced product will be limited to seats assigned at the rear of the aircraft, and guests will board last," said Chief Commercial Officer Andrew Harrison. "Upgrades for elites will not be permitted and the tickets will not be changeable or cancellable." Unlike the legacy carriers' versions of basic economy, Alaska's offering will still include advance seat assignment for free. Delta, United and American all introduced basic economy fares in the past year to better compete with low-cost carriers such as Allegiant, Spirit and Frontier. Those airlines each offer super-low fares while imposing a myriad of fees, many for things that air travelers used to consider standard, such as use of the overhead bin, seat assignments, snacks, more legroom and itinerary changes. Alaska Airlines leaders said they expect the new Saver Fares to drive $100 million in incremental revenue in 2019. Some business travel departments already steer clear of basic economy and will only book higher fare classes. "It is sad to see Alaska Airlines take up this practice of basic economy," Alan Waite of Seattle wrote on his Single Flyer blog. "It is setting up the customer for disappointment as the average customer doesn’t fully understand these fares. Personally, I hope that Alaska will change this decision before implementation in Fall 2018. Alaska typically doesn’t offer the cheapest tickets but instead offers the best service. I hope this isn’t a sign of Alaska’s willingness to participate in the race-to-the-bottom."